With a panoramic view of Table Mountain, Table Bay and Robben Island, Durbanville Hills Wines is situated in one of the most unique settings in the Western Cape. And to celebrate this unique view this summer, the cellar has made a vehicle available for visitors to experience one of the Seven Natural Wonders of the world along with a glass of wine. With collection points at selected guest houses and hotels in and around Cape Town, Durbanville Hills offers two options. The first involves a visit to Table Mountain, a stroll along the top and after descent by cable car, a tasting of Durbanville Hills’ wines at a look-out point overlooking the city. The second option is a visit to the home of Durbanville Hills Wines, a mere 20 minutes from Cape Town’s city centre offering either a tasting of eight wines or a biltong and wine pairing. The cellar has breathtaking views of Table Mountain and the modern tasting room, scenic views of the rolling hills and adjoining vineyards as well as an outdoor seating area for nature lovers to enjoy the indigenous renosterveld garden. The first option costs R130 per person and is available Monday to Thursday and collection between 08.00 until 08.45 and drop-off back at the hotel or guest house between 12.30 until 13.15. 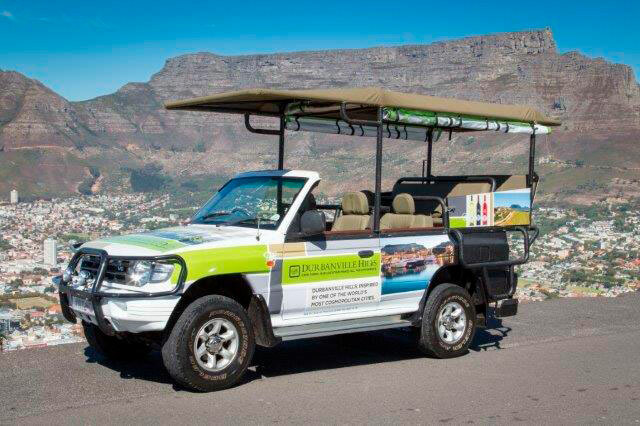 The visit to Durbanville Hills Wines costs R200 per person and is available on Fridays only and collection between 08.30 until 09.15 and drop-off back at the hotel or guest house between 12.30 until 13.15. For bookings contact Henri Bruce on 076 788 4992.